Despite its infancy, 3D printing technology is growing rapidly in capability and public accessiblity. It can now make objects at the same pixel resolution as a screen, with vibrant opaque and translucent colours and objects capable of resisting the forces of space flight. 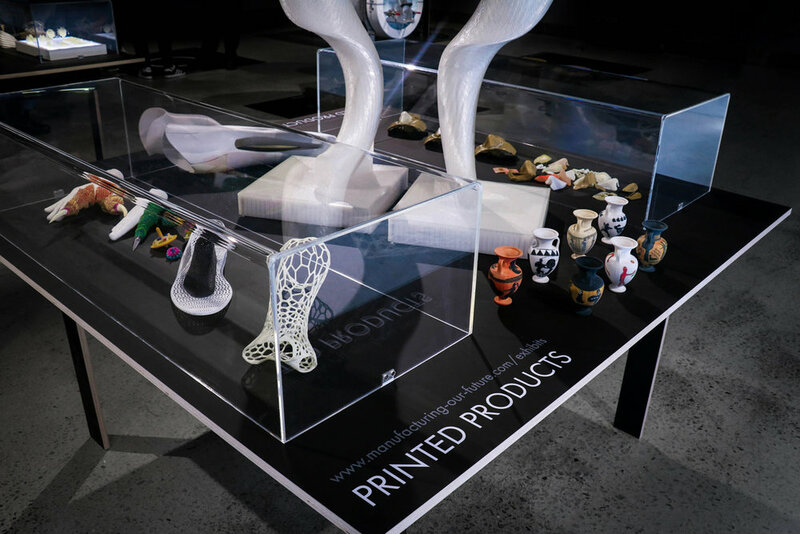 4D printing explores Design over time: allowing the choreography of movement; a deeper understanding of the life cycle of a printed part; and how it can be returned to raw printing materials ready for the next great idea. We started experimenting with these processes at the VUW School of Design over 15 years ago and have built research relationships with world-leading technology developers such as Stratasys and Shapeways, as well as local, advanced 3D printing users such as Weta Workshop and The New Zealand Artificial Limb Service. This in-house knowledge offers research groups across VUW the chance to work at the leading edge of a significant emerging technology to develop new printing processes and exciting uses for the technologies that already exist. The idea of the virtual world being expressed in the physical world raises some serious questions that will ideally be discussed before they are actioned. At the same time we need to continue assessing and discussing the impact of 3D printers becoming widely available given the knowledge we now have about the ubiquitous presence and use of computers. VUW is in an ideal position to participate in, and inform, these discussions. As the capability of 3D and 4D printing continues to grow, collaboration across VUW is vital to support New Zealand in becoming a leader in this new pioneering field. Hydrophytes are futuristic aquatic plants created with multi-material 3D printing. The project explores the design and choreography of movement bringing objects to life through 4D printing. The designs utilise Stratasys PolyJet technology that allows blends of rigid and flexible resins known as digital materials. Sealed chambers allow the 4D prints to activate independently through pneumatic inflation. The Hydrophytes illustrate a range of multifaceted, variable movements whose life-like qualities are unique to digital materials. These Computer-Generated Objects (CGO) take advantage of both the digital world, with its versatility and efficiency in formmaking, and the physical world, where objects can respond to the environment, humans and other printed objects. This balance between controlled design and uncontrolled natural interaction leads to the creation of compelling organic performances. With Tangible Animation, on-screen ‘magic’ can be transformed into immersive physical encounters, advantageous for museums, theme parks and the film industry. Until now surgeons have had to rely on relatively crude models to learn about the structure of the human body. Complex textural differences used to be obscured by the use of one rigid material. 3D printing is positioned to revolutionise healthcare; it is already being used to create anatomical simulations, prostheses, implantables and surgical instruments. Now advanced 3D printing technologies can be used to create complex models out of rigid and soft materials – just like human anatomy. In this project, VUW collaborated with two anaesthetists at Wellington Hospital to 3D model aspects of patients’ anatomy as an educational resource for clinicians. Specialist software was used to translate patient MRI and CT scans into 3D models. Using the cutting edge Stratasys J750 printer, we printed multi-coloured, multi-material versions of actual paediatric tracheas. Emerging from a series of experiments into 3D printing efficiency Siblings of Code is born of designs by Bernard Guy and the programming of Ben Jack. 3D printed in plant-based plastic the offspring embody the growing conversation between creative enquiry and digital tools, with a simple computer program that supplants premeditated design with serendipitous discovery. Freeform 3D Printing is a recent innovation in Additive Manufacturing. Through the use of CNC (Computer Numerical Control) and self-supporting extruded materials it utilizes the freedom of simultaneous movement on all three axes. After the initial deposit, material is extruded in space not requiring support material or traditional layering techniques. The Design Deposition project investigated a new approach to Plastic Extrusion 3D printing based on Freeform 3D printing that utilizes simultaneous movement on the x,y and z axes for the production of designed artefacts. Influenced by an Industrial Design perspective, the Form Responsive Method was developed in which intimate understanding and control of both software and hardware determines the outcome. The deposits of extruded plastic in patterns of lines and curves are embraced for their functional, aesthetic and tectonic qualities, crafting an artefact to the desired design without the wastage created by the traditional Plastic Extrusion Method. The series of Design iterations continue the discussion until craftsperson (the designer), worker (the printer) and material can agree on a solution. This dialogue allows the authorship of making to be reclaimed and the printer to become a tool for creating digitally crafted artefacts. Greek vases were an early form of social media. The mythical scenes decorating them often reflected historical events, social preoccupations or were made to provoke discussion and debate. Undergraduate first year Classical studies students at VUW were tasked with recontextualising a classical myth in a modern context and interpreting this new myth as a 2-dimensional tableau onto a paper template. This image was then mapped on to a 3D model of an ancient artefact and then 3D-printed in colour through Shapeways - a New York-based 3D printing service. The creative process allowed students to explore contemporary issues and their own identities using ancient myths both as stories and tools to think about society and culture, thereby translating classical myths into a modern context. 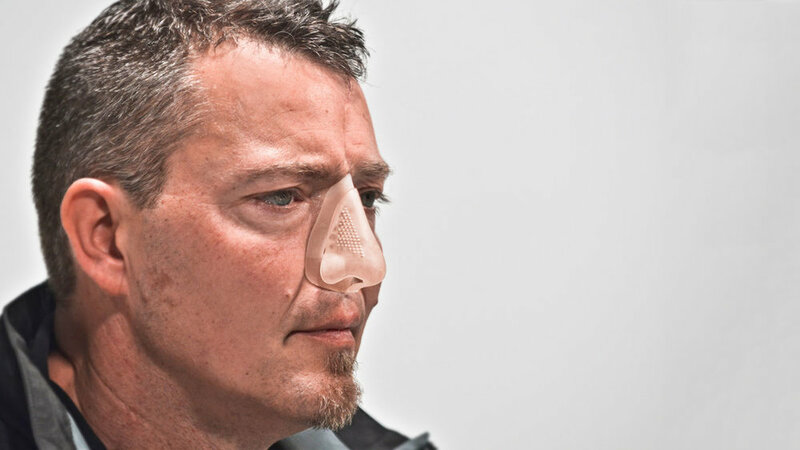 The loss of a nose or ear is typically remedied with a handcrafted silicone prosthesis. Most are a form of concealment and fail to instil confidence in patients. Many avoid social interactions for fear of their prosthesis being ‘discovered’ or knocked off, revealing the loss. This research seeks to redefine facial prostheses. Not as an apology for a missing feature, but as an honest and desirable declaration of the condition, in the way that spectacles moved from prosthesis to fashion statement. 3D scanning and generative software can make customizable and financially viable prostheses. The scanner maps features as an anatomical landscape from which programs can generatively model structures, like the abutment and facade seen here. Multi-material 3D printing builds each component with variable densities and rigidities, like the body uses cell division to build anatomical parts. The flexible materials allow smiling to occur by accommodating facial movement. The research happening at the VUW School of Design encourages students to search for applications beyond the known. The creative view of the world they develop during their studies is proving to be a real asset when job hunting after graduation. Some research translates into business ventures (Goodnature), while other research demonstrates superb knowledge of technology that can be applied in any field. The students participating here have been able to secure jobs with leading businesses both locally and internationally by displaying creative imagination, experience and knowledge of 3D printing technology and sensitivity to clients’ needs. They include Tor Robinson and Jake Evill now at Weta Workshop and Earl Stewart at Nike Inc. USA. The learnt ability to transform emotions into ideas and then into real objects is both a personal asset, but also an indispensable asset for shaping New Zealand’s – and the world’s – future. A benefit of plastic is that it can shapeshift from a drink bottle to a loudspeaker. This is perfectly matched with a computer’s ability to generate and manipulate forms on screen. 3D printing is the simplest way of transporting these from the screen into the physical world. Ross Stevens looked at how he, could create a product (loudspeaker) with generative code-based free software. The design took only 8 minutes to create, using a modifiable template that even a child could use on a phone. A form was quickly created well beyond the Designer’s imagination and comprehension.It was made on the VUW in-house BigRep 3D printer using recycled plastic (PET) drink bottles. A great loudspeaker for now, this ability to shapeshift means it could have a future life as any number of designed objects. A major hurdle to starting a manufacturing company - especially in New Zealand - is the low production volume and upfront tooling costs. Digital tools offer an economic alternative by allowing products to be manufactured directly from computer files. As the product is not constrained by any design tool limitations, the flexibility of the digital process allows for quick adaptations to the market and technical improvements as required. The Pureaudio remote explored this potential in a real world scenario by printing a range of remotes in plastic and metal. The study compared different materials as well as printing bureaus by having prototypes made in New Zealand (RAM3D, 3DprintNZ, Addlab), the USA (Shapeways, ExOne) and Hong Kong (HK3Dprint). In-depth research was carried out by Stephen Hill in his Master of Design Innovation degree, which focused on titanium printing with Rapid Advanced Manufacturing (RAM3D) in Tauranga. By losing a limb a person not only experiences acute personal loss, their whole lifestyle gets turned upside down. This has a negative impact on the physical as well as the mental health of the person. Enabling someone to enjoy physical exercise, was the aim of a collaboration between VUW and the NZ Artificial Limb Service (NZALS). The project was initiated by the NZ Artificial Limb Service and developed by Stuart Baynes in his Master’s thesis. The aim was to create a prosthesis that fits comfortably, is easy to use, and encourages a symmetrical body posture for swimming. Resolving the practical aspects of the prosthesis were most relevant. However, feedback on the comfort and look were also important parts of the Design process. Making the patient part of the Design process ensures a better fitting prosthesis, and an increase in health outcomes.